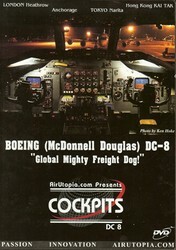 Boeing (McDonnell Douglas) DC-8 "Global Mighty Freight Dog!" Cockpits DVD is an amazing classic 1980s journey inside the cockpit of the mighty DC-8. The Douglas DC-8 was a four-engine airliner that was produced from about 1959 to 1972. The DC-8 30 series carried over 170 passengers and 3 crew with a range of about 4600 miles. The DC-8 was the direct competitor of Boeing 707 jetliner at the dawn of the jet age. Although the Boeing outsold the DC-8 in the late 1950s and 1960s by two to one, the DC-8 proved to have greater staying power with roughly 40% of all DC-8s produced still in service by the early 2000s versus less than 10% of all 707s. First flown in 1958, the Douglas DC-8 was introduced in 1959, flying with United and Delta Airlines. Over 500 DC-8 in several variants were produced until production ended in 1972. In the United States, airline operators included Braniff, American, Florida Express, US Air and Mohawk airlines. Many former DC-8 airliners were later used for hauling cargo - as in the DC-8 "Global Mighty Freight Dog!" DVD. The DC-8 DVD includes interviews with DC-8 Captain Dave Bertrand who provides great insight into the piloting of the DC-8 aircraft. Also included on the DVD are in-flight cockpit shots and cockpit views during takeoffs and landings. There are approaches and landings to London Heathrow Airport, Anchorage, Tokyo Narita, and the legendary Kai Tak Airport in Hong Kong. If you're are a DC-8 or classic jet fan, current or future pilot, or flight sim enthusiast, then this DVD belongs in your collection. 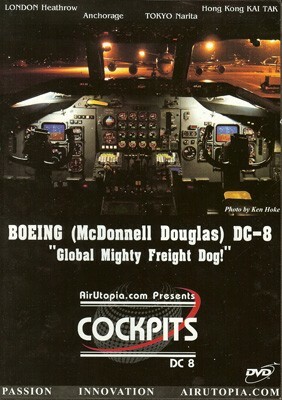 Run time for the DC-8 "Global Mighty Freight Dog!" DVD is 90 minutes. Format is NTSC DVD and region-free.